The Earth's atmosphere differs from the atmospheres of most other rocky planets and moons in our solar system in that it is rich in nitrogen gas, or N2; the Earth's atmosphere is 78 percent nitrogen gas. Titan, the largest of Saturn's more than 60 moons, is the other body in our solar system with a nitrogen-rich atmosphere that resembles ours. Compared with other key elements of life—such as oxygen, hydrogen and carbon—molecular nitrogen is very stable. Two nitrogen atoms combine to form N2 molecules that stay in the atmosphere for millions of years. The majority of nitrogen has an atomic mass of 14. Less than one percent of nitrogen has an extra neutron. While this heavy isotope, nitrogen-15, is rare, N2 molecules that contain two nitrogen-15s—which chemists call 15N15N—are the rarest of all N2 molecules. The team of scientists measured the amount of 15N15N in air and discovered that this rare form of nitrogen gas is far more abundant than scientists had expected. 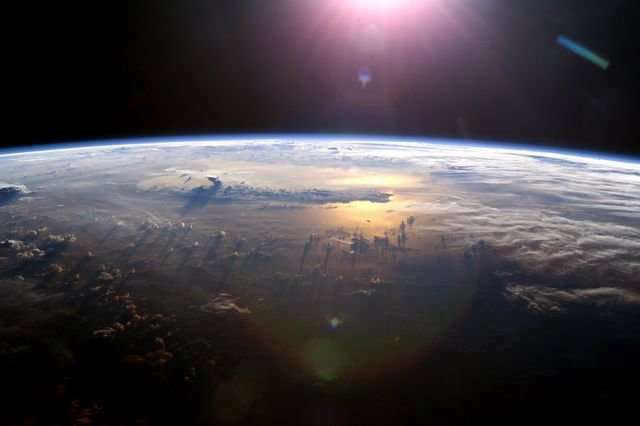 The Earth's atmosphere contains about two percent more 15N15N than can be accounted for by geochemical processes occurring near the Earth's surface. "This excess was not known before because nobody could measure it," said senior author Edward Young, a UCLA professor of geochemistry and cosmochemistry. "Our one-of-a-kind Panorama mass spectrometer allows us to see this for the first time. We conducted experiments showing that the only way for this excess of 15N15N to occur is by rare reactions in the upper atmosphere. Two percent is a huge excess." Young said the enrichment of 15N15N in Earth's atmosphere is a signature that's unique to our planet. "But it also gives us a clue about what signatures of other planets might look like, especially if they are capable of supporting life as we know it." "We didn't believe the measurements at first, and spent about a year just convincing ourselves that they were accurate," said lead author Laurence Yeung, an assistant professor of Earth, environmental and planetary sciences at Rice University. The study began four years ago when Yeung, then a UCLA postdoctoral scholar in Young's laboratory, learned about the first-of-its-kind mass spectrometer that was being installed in Young's laboratory. "At that time, no one had a way to reliably quantify 15N15N," said Yeung, who joined Rice's faculty in 2015. "It has an atomic mass of 30, the same as nitric oxide. The signal from nitric oxide usually overwhelms the signal from 15N15N in mass spectrometers." The difference in mass between nitric oxide and 15N15N is about two one-thousandths the mass of a neutron. When Yeung learned that the new machine in Young's laboratory could discern this slight difference, he applied for grant funding from the National Science Foundation to learn exactly how much 15N15N is in the Earth's atmosphere. These experiments suggested that one should see a bit more 15N15N in air than random pairings of nitrogen-14 and nitrogen-15 would produce—an enrichment of about 1 part per 1,000, Yeung said. "There was a bit of enrichment in the biological experiments, but not nearly enough to account for what we'd found in the atmosphere," Yeung said. "In fact, it meant that the process causing the atmospheric 15N15N enrichment has to fight against this biological signature. They are locked in a tug-of-war." "We think the 15N15N enrichment fundamentally comes from chemistry in the upper atmosphere, at altitudes close to the orbit of the International Space Station," Yeung said. "The tug-of-war comes from life pulling in the other direction, and we can see chemical evidence of that. We can see the tug-of-war everywhere."